Sleek soda maker in the pantry - Where is it from/what is the brand? Hi! I believe it is a Soda Stream. 2. Monochrome nicheWhat could have been used as a pantry gets put to work in this kitchen as a neat little desk area. All it took were a few simple white shelves, a black bentwood chair and a firm resolve to keep the clutter out. Remember, bigger is not always better when you are renovating, and you are most likely going to be paying a per-square-metre rate to your builders. Create a layout determined by the way you and your family live on a daily basis. 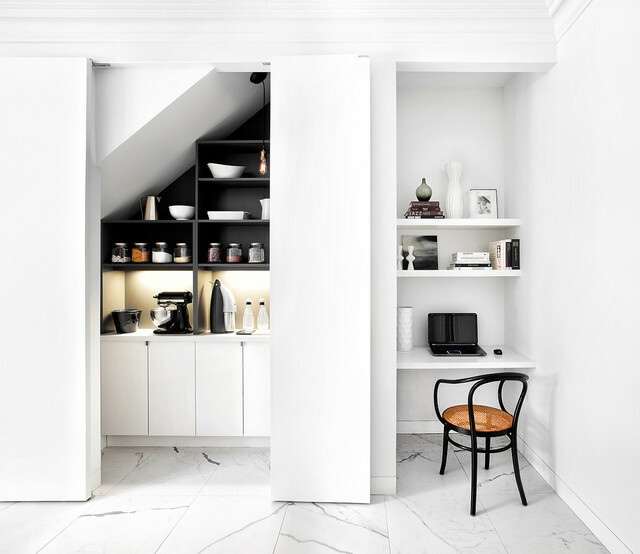 If you don’t have enough room or ceiling height to build an enclosed room under the stairs, a recessed nook or walk-in-cupboard can still make a big difference. Here, dual sliding doors conceal the kitchen pantry, while a separate study nook is finished with open shelving, giving the space the flexibility of being used as a mini home office or as storage space.Tip: Sliding doors like the pocket design above require less room than regular doors so are great to use in small spaces.